Is teaching high school at home even a possibility? It’s more than a possibility, it can be a reality! But teaching your teen will require commitment and preparation. 1. Know your state homeschool laws. HSLDA provides the legal analysis for each state detailing home school requirements. Homeschool laws vary from state to state and may change from year to year; so be sure to keep current by viewing your legal analysis at least once a year. HSLDA members may contact the legal department if they have any questions. 2. Know the course options available to you. From parent-taught courses, to online courses, to co-op classes, to dual enrollment courses, there are plenty of alternatives from which to choose. Most parents take an eclectic approach when it comes to course options. Perhaps you’ll decide to teach some courses at home, but then enroll your teen in an online class, while also supplementing with a course offered by a co-op! Whatever course format you choose, these links will provide you with a starting place to explore the options. Remember that these links provide only a sampling of the many resources available to you. 3. Know the key ingredients when developing a high school plan. Your teen’s high school plan can be custom designed to best suit interests and future plans. This newsletter gives you tips as you outline a plan. Watch this short high school video on Developing a High School Plan to better understand how to choose courses for your teen. A Guide to Homeschooling through High School offers three sample high school plans with suggested courses in each subject area. 4. Know where your teen is headed after graduation! Whether headed to the workplace, military, or college, your teen can use the high school years to prepare. Although most teens are unsure about their future plans at the beginning of high school, you can help narrow the focus by giving your teen a career interest test or design a career development course. 5. Know what records to keep. You are your teen’s official school record keeper! Maintain good records as your teen progresses through high school. The records are the source data for creating your teen’s transcript. View these sample transcripts and use our free templates. You may also send us your transcript via email attachment at highschool@hslda.org and we will review it and make suggestions. Watch this short transcript video for additional information. 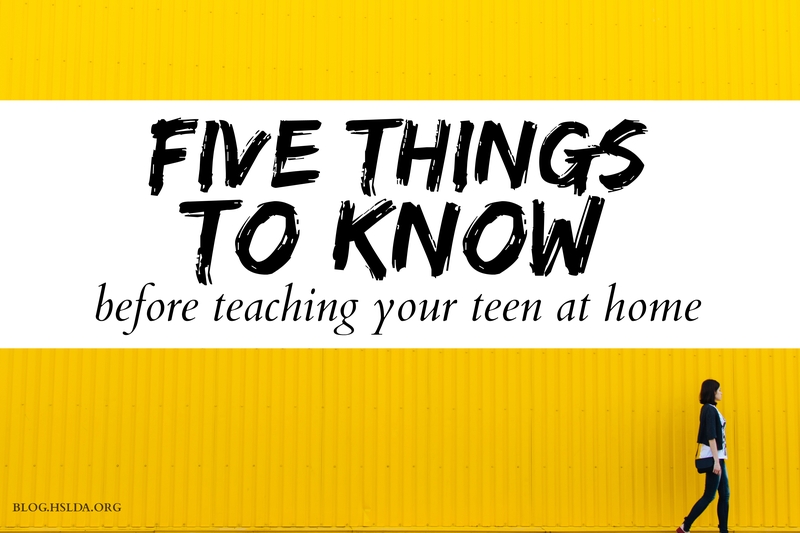 Teaching high school at home is not only possible, but it can also be a rewarding and enjoyable experience for you and your teen. With HSLDA high school resources, we’ve got you covered!